The company Lavazza appeared in 1895 in Italy. Lavazza imports coffee from around the world. According to the results of marketing research, 80% of Italian consumer families choose Lavazza. Therefore, the company’s slogan is “Italy’s Favorite Coffee”. Lavazza does not mean branded stores only – the brand cooperates with popular coffeehouse chains – Starbucks and Caribou Coffee. Today Lavazza offers dozens of varieties of natural coffee – varying degrees of roasting, variously blended, ground and in grains. All these varieties differ significantly in taste and aroma. Qualita Oro is the most classic version of Italian coffee. Arabica grains medium roast from Brazil. Beans of this sort is distinguished by a soft honey-floral taste and a strong pleasant smell. Pienaroma has a low level of caffeine, an unusual sour taste, and is well suited for cooking cappuccino and latte. It consists only of arabica grains. Caffe Espresso Luxurious coffee from 100% arabica, collected on different continents – America and Africa. The grains for this expensive beverage are subjected to special roasting, thereby achieving a rich taste of authentic espresso. iTierra A mixture of 100% American arabica has a deep taste and warm floral notes, with a thick foam and a thick consistency. The iTierra is ideal for the first half of the day. Filtro Classic is created exclusively for drip appliances. It is a mixture of South American and African arabica with a floral aroma and a mild, spicy taste. Lavazza Club Classic blend of 100% arabica. This beans is medium roast and has a soft taste. It is designed for cooking mocha in a geyser (mocha pot). Bella Crema is a magnificent blend of Brazilian and American arabica. Coffee is prepared with a thick foam and caramel-vanilla flavor. Espresso Gran – Indonesian arabica, suitable for cooking in the percolator and in the coffee machine. It is a thick and strong coffee with a slight taste of chocolate. Gold Selection is one of the best blends of arabica. It has a bright aroma and a light creamy milk taste. Top Class Lavazza. One of the most unusual blends with a chocolate flavor and a touch of toffee. 10% blend – Indonesian robusta, the rest – the best arabica (Brazil and Central America). Super Gusto takes place of an organic coffee, grown in an environmentally clean area, without the use of chemical fertilizers. Crema Aroma is used for making drinks with the addition of milk. You can cook it in any way, its soft and delicate taste does not change from this. Crema e Gusto Forte is a mixture of African robusta with Brazilian arabica. It is distinguished by a strong degree of roasting. Recommended for cooking American. Contains a large amount of caffeine. Super Crema is perfect for any type of preparation. This is one of the most purchased blends of robusta with arabica. It has a gentle and light taste. Charming coffee for lovers of soft taste and lush foam. Crema e Gusto has a pronounced smell of chocolate and a spicy creamy taste. From this mixture with the predominance of Robusta, it makes a very strong and rich coffee. Qualita Rossa A classic coffee blend of Arabica and Robusta with a deep taste and a warm chocolate aftertaste. Ideal for all kinds of drinks – espresso, cappuccino and latte. Decaffeinato is the only grade in the line of Lavazza that does not contain caffeine. However, the taste and aroma of this mixture like real coffee. Suitable for any method of cooking. Gran Riserva is a high-caffeinated variety, used only for electrical devices. The taste is slightly sour, but not bitter. Qualita Oro This is a coffee blend with the longest history. Sensual taste of this drink is a combination of Arabica from Central America with its floral-fruity shades and noble Brazilian arabica with a taste of honey and malt. 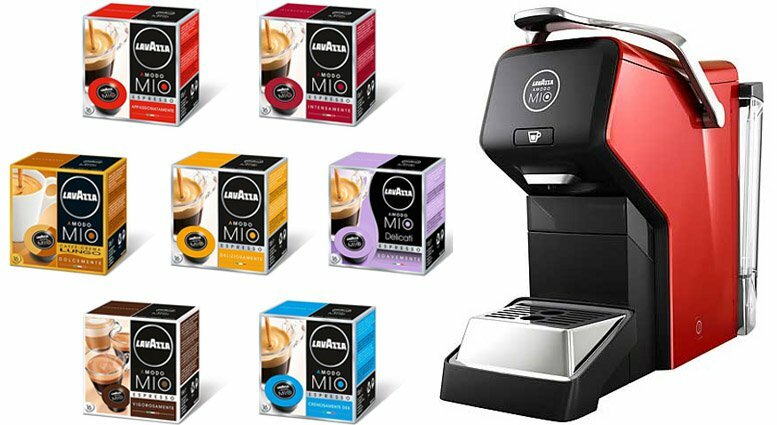 Lavazza is an exquisite mix of ground and grain coffee: in packs, capsules and pods. And also – syrups, chocolate, sugar, paper and glass glasses, cups, napkins and, of course, – coffee machines. The company has developed its own coffee machine Lavazza BLUE. A special principle of extraction in the work of the device provides a unique taste and classic flavor of this espresso “Lavazza”. Such appliances are compatible only with Lavazza capsules. Capsule system A Modo Mio and capsule machines Lavazza, although they appeared relatively recently, began to enjoy great success with the consumers. 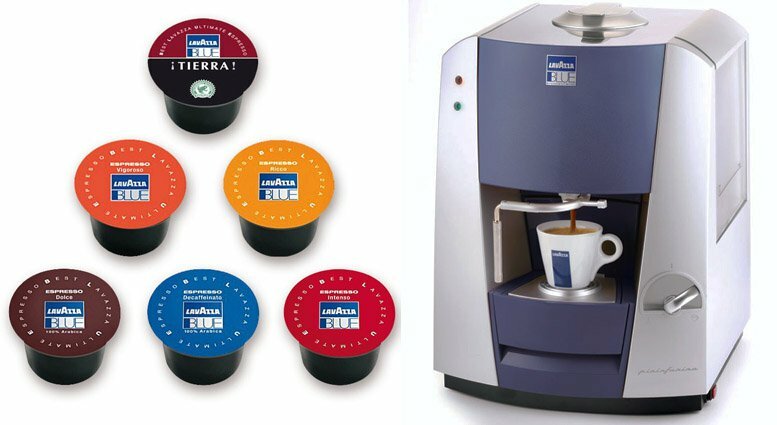 For capsular coffee machines Lavazza used brand coffee in capsules. Hot drink is prepared by perforating the capsule and feeding water under high pressure. Then the finished drink is filtered and poured into a cup. If you press certain buttons, the capsule system Lavazza will not only make coffee, but will also be able to whip and pour the milk. A real Italian espresso is easy to recognize at a glance: a thick foam, a full body and a rich aroma. The A Modo Mio capsule system gives you the opportunity to enjoy a cup of your favorite coffee anywhere: at home, on the corporate at the office, and even in the car with Lavazza’s EspressGo.